La Liga side Villarreal are looking to tie Samuel Chukwueze to a new deal, according to reports in the Spanish media. According to Marca via fichajes.com, The Yellow Submarine are set to begin contract talks with the Nigeria international in a bid to fend off interest from the English Premier League and other unnamed clubs in Europe. Although the identities of the Premier League clubs have not been revealed, allnigeriasoccer.com understands that Arsenal are long-time admirers of the winger while Leicester City are his other suitor in England. The 2015 U17 World Cup winner costs Villarreal 500,000 euros when he joined the club from Diamond Academy and currently has a release clause of 40 million euros. 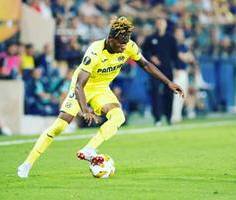 Chukwueze has become one of the hottest teenagers in world football on the back of his matured displays for Villarreal, for whom he has made 29 appearances, scoring 7 goals (3 assists). Recently named the Nigeria Football Federation Young Player of the Year, he increased his burgeoning reputation with a goal and assist in Villarreal's 4-4 draw with Barcelona on Tuesday night.